Although the decline of Dutch gas production was long anticipated, the abruptness of the fall came as a surprise to industry observers. 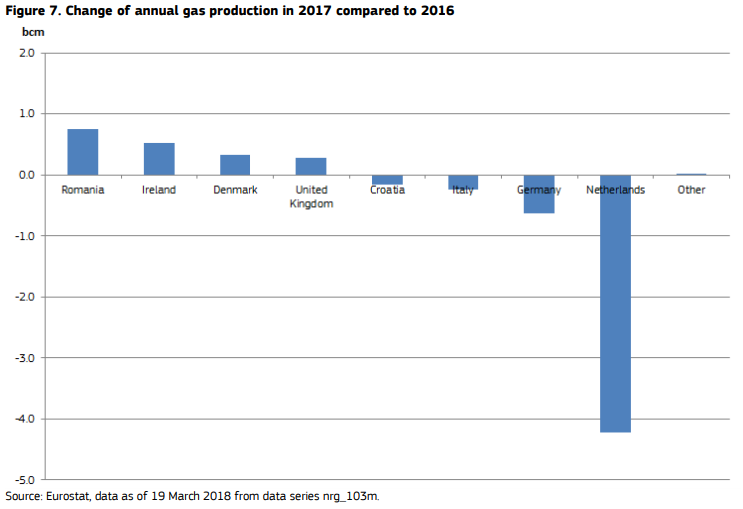 “We did not realise until relatively recently that, in the Dutch gas sector, [production] would decline very quickly,” said Jonathan Stern, head of the Natural Gas Research Programme at the Oxford Institute for Energy Studies in the UK. “The only question is to the speed of the decline,” he told EURACTIV in an interview. How Europe eventually replaces Dutch production will probably redefine the fundamentals of the EU gas market in the coming decade or so. In fact, the effects are already being felt in a market where consumption is propped up by a gradual switch from coal to gas resulting from the pressure to decarbonise energy. Natural gas consumption in Europe last year reached its highest level since 2010, according to EU figures released in April. And the vast majority of it was imported, representing a whopping 360 billion cubic meters (bcm) of the 491bcm consumed in Europe, up 10% from 2016. This resulted in an estimated import bill of €75 billion, the European Commission said in its latest quarterly report on European gas markets. “Recently, gas volumes have risen again, driven by factors such as economic growth and the replacement of coal-fired power generation by gas,” said Dennis Hesseling, head of the gas department at the Agency for the Cooperation of Energy Regulators in Europe (ACER). “Next to that, seasonal gas demand for heating is highly temperature-dependent,” he said referring to the cold 2017-18 winter, which fuelled higher demand for gas. For the Netherlands, the combination of these factors was spectacular. For the first time, the country became a net importer of gas on an annual basis last year, reflecting the steady decline in supplies coming from North Sea fields. 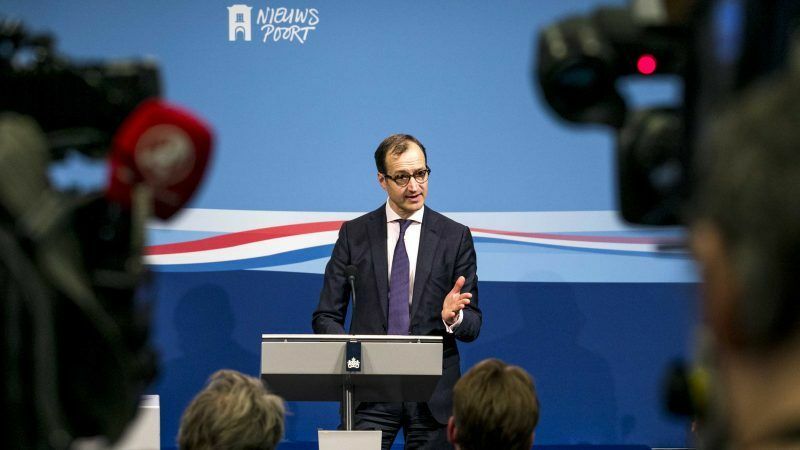 On 29 March, the Dutch government announced it will cut production at the Groningen gas field to 12 billion cubic meters (bcm) per year by 2022, and to zero by 2030. Russia, meanwhile, maintained its role as Europe’s dominant supplier, at 43% of EU imports. 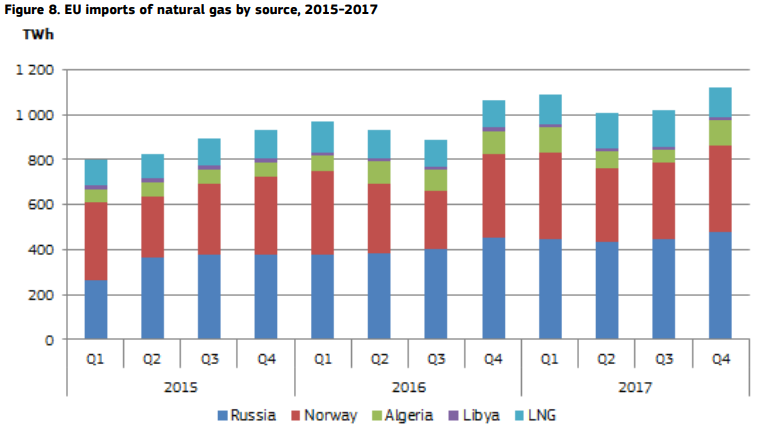 Pipeline gas from Norway came a distant second, at 34%, while the combined share of Algerian and Libyan supplies stood much lower, at 10% of EU imports in 2017, down from 11% in 2016. “The general trend is that the domestic EU production is declining and the import need of gas is increasing. And that’s a trend we’ve seen coming for years,” said Jannik Lindbaek, the head of EU office at Statoil, the Norwegian energy company. With domestic production falling inexorably, no country other than Russia seems in a position to raise its production significantly – at least in the short to medium term. For different reasons, imports from Algeria and Libya are projected to erode slightly. And Norwegian imports aren’t expected to grow much either: “We have the capacity to supply the European gas market from the Norwegian Continental Shelf at the current level towards 2030,” said Statoil’s Lindbaek. This leaves policymakers in Brussels grappling with an uncomfortable reality: Despite their best efforts to liberalise gas markets and diversify supplies, Russia is likely to remain Europe’s dominant supplier for many years. “The key development that nobody outside the gas industry recognises is the collapse of Dutch production at the Groningen field,” Stern told EURACTIV. “This is what is absolutely unbelievable for me: when politicians and media commentators speak about gas security problems, they only talk about Russia and nothing else. Whereas when gas industry people speak about security of supply, what they speak about is the decline of production in the Netherlands, the UK and, further in the future, Norway,” Stern said. Imports of Liquefied Natural Gas (LNG) will undoubtedly fill some of the gap left by falling Dutch production. In 2017, LNG imports covered 14% of total extra-EU gas imports, up from 13% in 2016, a share which is only projected to grow. Research by Bloomberg New Energy Finance (BNEF) shows LNG demand in Europe is expected to jump to 23.1% in 2030, on the back of falling domestic production in the North Sea and reluctance to import more gas from Russia. But in the short term, the liquid and well-connected Northwest European market was not very attractive for LNG supplies: There, LNG has to compete with cheaper indigenous production and pipeline imports from Norway and Russia, notes the Commission report. As a result, LNG carriers sailing off from the US, Australia or elsewhere make more money shipping supplies to Asian markets, where consumers are ready to pay a higher price. That could change if consumers in Europe are ready to pay more. Otherwise, there is no reason why European markets should go for anything else than Russian gas, which is cheaper, more abundant, and essentially more competitive. “In terms of pure economics, pipeline gas should win hands down,” said Spencer Dale, the chief economist at British oil and gas company BP. “Particularly Russia has very large reserves and very low-cost gas. And it has very big pipelines going to Europe. It has a huge competitive advantage relative to imports of LNG from anywhere else in the world,” Dale told EURACTIV in a recent interview. 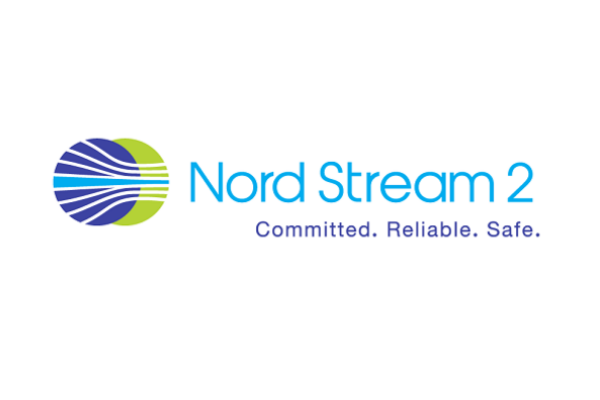 Russia’s position will only strengthen when the Nord Stream 2 pipeline is built, roughly doubling Gazprom’s capacity to export gas to Europe directly to Germany via the Baltic Sea. For EU policymakers bent on diversifying supplies away from Russia, this is perceived as a slap in the face. But “the problem is that there isn’t any other gas,” Stern said. “At least not in the short term. And that’s what people can’t accept”. What’s more, Russia has skillfully navigated through Europe’s changing regulatory landscape, taking advantage of more competitive market conditions imposed at EU level. 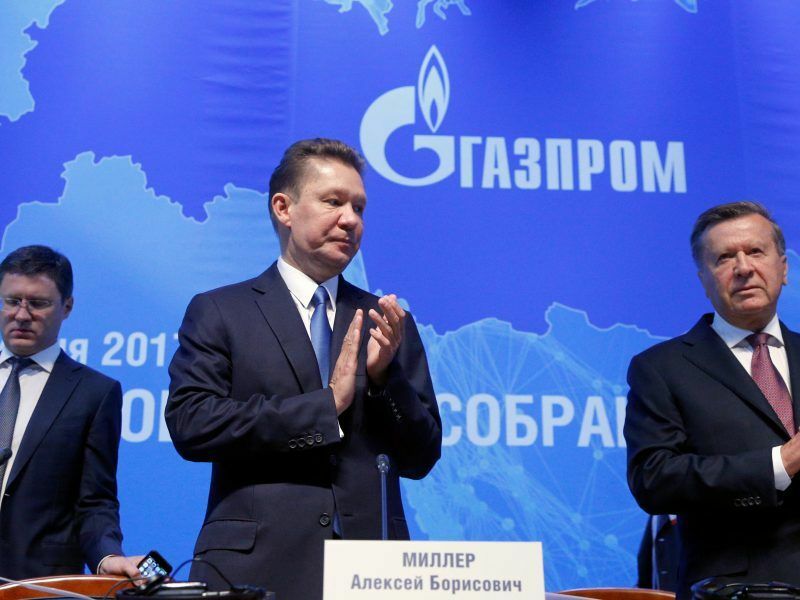 Last year, Europe received its first cargo from Novatek’s new Yamal LNG facility which means that, for the first time, a company other than Gazprom supplied Russian gas to the EU, the Commission said in its report. Switching to more flexible “hybrid” contracts – combining hub prices and long-term price commitments – has also allowed Russia to increase its market share from 42% in 2016 to 43% in 2017. According to BP’s Dale, Europe shouldn’t feel nervous about this. Most EU countries now have LNG terminals, which are currently used at around 25% of their maximum capacity. Should supply disruptions happen, Europe would now be in a position to import LNG at world prices, he pointed out. “With the growth of LNG, there is increasingly a globally integrated gas market now, just as there is a globally integrated oil market,” Dale said. He remarked that Europe is nowadays more dependent on Russian oil than gas, which doesn’t seem to bother anyone because oil is a globally traded commodity where suppliers can easily be replaced. “Have you ever heard anybody in Brussels telling you this poses an energy security problem?” Dale asked. European LNG imports will be pushed over 104MMtpa by 2030, according to John Twomey, head of European gas analysis at BNEF. Still, the diversification of suppliers has remained at the centre of the EU’s gas policy since the 2009 crisis when Russia and Ukraine failed to agree a tariff for the transit of Russian gas to Europe. 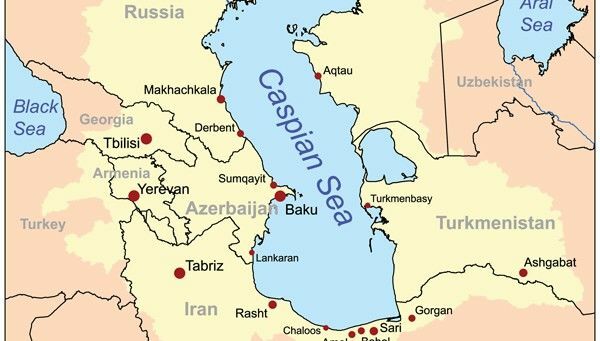 For instance, the European Union hasn’t given up on its pet project of importing large amounts of gas from the Caspian region, through the so-called Southern Gas Corridor. The first gas from this complex network of pipelines is expected to be delivered to Turkey in June or July this year, said BP’s Spencer Dale. However, the completion of the Southern Gas Corridor has suffered delays because of political and commercial complications. And the current, scaled-back version of the project, which is planned to run through Turkey, doesn’t look politically attractive to Europe as it grapples with Ankara’s authoritarian regime. “I don’t want to be too negative about this because I still think the Southern Gas Corridor could be a bigger success. But it’s already taken a long time and it’s going to take quite a lot longer,” Stern said. This is probably why the European Commission is so keen to place the emphasis on demand-side reduction, while massively converting Europe’s energy mix to electricity produced from indigenous renewable sources, in line with the bloc’s broader climate objectives. “We have to have a frank and objective discussion about how much gas we really need in the future in the post-CoP21 context and against the background of the 2030 climate and energy framework,” Maroš Šefčovič, the EU Commission Vice-President in charge of the Energy Union, told the European Parliament in 2016. However, these are long-term transitions which imply a deep transformation of how energy is produced and consumed. Until this happens, imported gas is likely to remain a significant part of the European energy mix. Meanwhile the member states want to reduce energy efficiency ambition – that is what the May 16th negotaitions will be about – a reduce energy efficiency ambition – yeah – joined up thinking – a 10 year old could do better. Euro politicians? – giving village idiots a bad name. The swift move towards a net importer position for the Netherlands can be entirely explained by the quickly increasing restrictions on annual gas production from the Groningen field, as a response to intensifying earthquakes in the area. If Mr. Stern (or his colleagues) would have taken the effort to check on natural gas news in the Dutch media, he would not have been surprised about this trend. The need for severely limiting production levels of the Groningen field is already for several years a fierce public debate.